When you ask yourself if you should call a personal injury attorney, the answer is almost always yes. 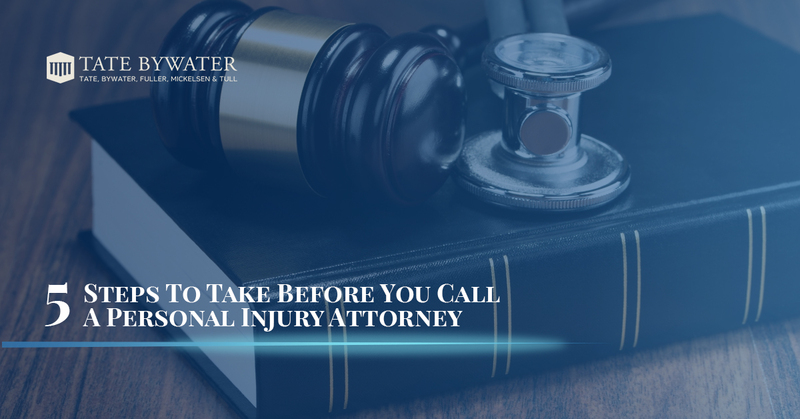 But after you’ve been injured and are considering seeking recompense for personal injury, there are a few things you should do first. Let’s say that you’re shopping in a grocery store and you reach for a can of green beans. When you pull your hand back, you feel a sharp pain and realize that the shelf was improperly installed, causing a severe cut on your hand. What should you do? First, if the cut is bad enough, stop the bleeding and get immediate medical attention! You don’t need to be bleeding all over the can of food. If surveillance footage becomes evidence, you’ll want to be able to point to the time that it happened. If the footage is missing from that time, that looks suspicious and it helps if you can correlate the missing footage to an exact time. Some witnesses will walk away, others will ask if they can help. Get their names so that they can verify that your injury occurred in the store. First of all, you don’t want anyone else to get injured on the same shelf. You also don’t want anyone else to come in contact with your blood. The store will need to file a report, and you want them to put it down in writing that it was indeed their equipment that hurt you. Head to urgent care and get checked out. After all, you want to make sure that your health isn’t at risk. Your injury might be glued or require stitches, and the personnel might give you a tetanus shot if you haven’t had one in a while. Visiting a medical facility is an excellent way to document exactly what has happened and will help to prevent secondary infection. Documentation can go a long way to helping you prove your injury was the negligence of the store. If you are asking yourself “should I seek out the help of a personal injury attorney,” the answer is “yes.” It’s important to get everything moving as quickly as possible so that the legal process can begin and you have the best chance of getting the outcome you desire. Contact TATE BYWATER for a consultation.